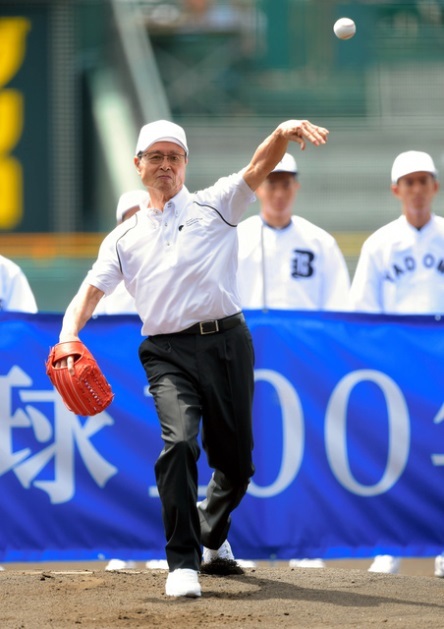 Baseball legend Sadaharu Oh throws a pitch at the opening of the 97th National High School Baseball Championship, at Hanshin Koshien Stadium, on Aug. 6, 2015. NISHINOMIYA, Hyogo -- The 97th National High School Baseball Championship got underway at Hanshin Koshien Stadium here on Aug. 6, with 49 high school teams vying for the right to call themselves the best in Japan. This year's championship, an annual event that focuses the nation's attention on the temple of Japanese high school baseball that is Koshien Stadium, is a little extra special as 2015 marks 100 years since tournament high school baseball began in Japan. Seven teams are making their first ever appearance at Koshien this year. On the other end of the scale, the first game of the tournament was played between Hokkai High School from southern Hokkaido -- which has gone to the tournament a record 36 times -- and Kagoshima Jitsugyo High School -- making its 18th appearance. (Kagoshima Jitsugyo demolished Hokkai by a sore of 18-4). At the opening ceremony, players from Waseda Jitsugyo High School and nine other schools that appeared in the very first national high school baseball tournament in 1915 marched onto the field in period uniforms to commemorate the centenary. Waseda Jitsugyo graduate and baseball legend Sadaharu Oh, 75, threw out the ceremonial first pitch. Before his dazzling playing career and many years as a manager, Oh appeared in four straight Koshien tournaments starting in 1956. "Baseball's roots are in high school baseball," commented Oh. "It's not all about winning or losing. I hope the players will create good memories here."